Since the start of my two movie blogs I’ve discovered a rich tapestry of fantastic independent , world cinematic movies; discovering that there is life outside mainstream cinema and personally at times I prefer it to the big boys. One Film festival which kicked off tonight in London is the Raindance Filmfest and what I love about this festival is they showcase the great indie movies in and around the UK, as well as the world and give new talent a platform to showcase themselves. They also give the ordinary person from the street a chance to enjoy some alternative movies too. One movie which will have its world premiere will be THE LAKE EFFECT, a new movie coming off its win at the Moondance Film Festival in Colorado, The Lake Effect has a stellar cast including Kay Panabaker (Fame), Ross Partridge (Baghead) and UK-native Tara Summers (Factory Girl). Part of the new crop of DIY filmmakers, director Tara Miele was eight months pregnant while shooting The Lake Effect, a film about parenthood. Below is the trailer for the movie which will kick off on October 5th and 6th at Apollo cinema London. Also below is some new images as well the movies offical press release too.A big thanks to Jennifer Westin one of the movies Producers who sent me the email containing the info in this post. FEATURE FILM THE LAKE EFFECT WILL HAVE ITS INTERNATIONAL PREMIERE AT THE RAINDANCE FILM FESTIVALLOS ANGELES—Covert Productions announces the international premiere of the independent feature film The Lake Effect at the Raindance Film Festival in London. The film recently played at the Moondance International Film Festival in Colorado where it won top honors.The film stars Kay Panabaker from Fame, Ross Partridge from the Duplass Brothers’ film Baghead and UK-native Tara Summers from television’s Boston Legal and Damages.Writer/director Tara Miele’s short films have screened at festivals including South By Southwest and Slamdance. She has sold scripts to Lionsgate and Gold Circle Films among others. 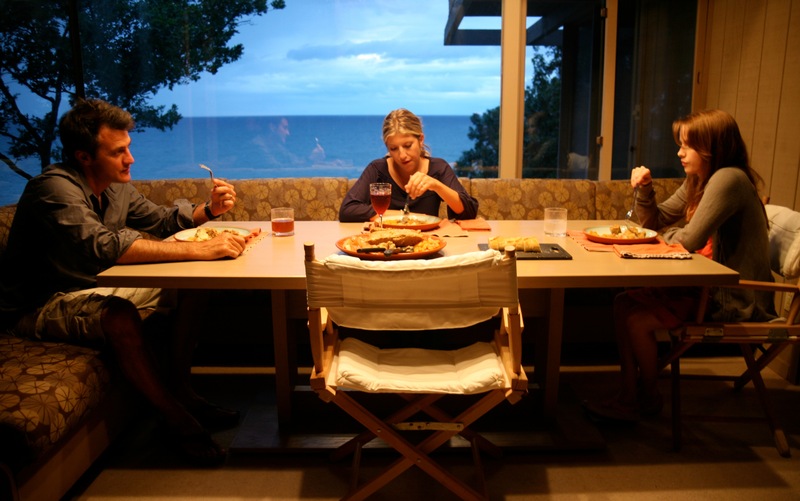 The Lake Effect is her directorial feature debut.Part of the new crop of DIY filmmakers, Miele and producer Jennifer Westin shot the film in Westin’s family’s house on Lake Michigan over just 15 days. The small cast and crew braved communal living (in said location) and a three-day power outage during production to turn in an intimate honest portrait of modern family life.The Lake Effect is a dramedy about a couple who retreats to their cottage on Lake Michigan to reconnect. Natalie’s biological clock is ticking; Rob’s resistant to change. But their holiday is interrupted when Rob’s estranged and very pregnant teenage daughter Celia lands on their doorstep. His marriage on the rocks and his daughter in need, Rob must embrace his role as a family man before he becomes a grandfather.Miele was eight months pregnant during production. On directing a movie about pregnancy while pregnant, Miele says, “Making a movie and having a baby are pretty much the same: it’s a lot of waiting, a lot of pushing, and once you finally get it out in the world, you just hope people are nice to it.”The Raindance screenings are Tuesday, Oct 5th at 9:10pm and Wednesday, October 6th at 1:45pm at Apollo Cinema Piccadilly Circus. Tickets are available via the festival’s website. Oh ok thanks so much!! Keep me posted! =) I really want to see this movie it looks really good! Have you seen the movie or just the trailer? Ive just seen the trailer, but have heard alot of positive things about it, i was hoping to go to raindance film festival which is in a way the uk’s sundance festival and next april the sundance festival is coming to the uk! not alot of new but at least its an idea of when its coming out, maybe keep checking the movie website and follow the movie at facebook you’ll eventually get exact date.